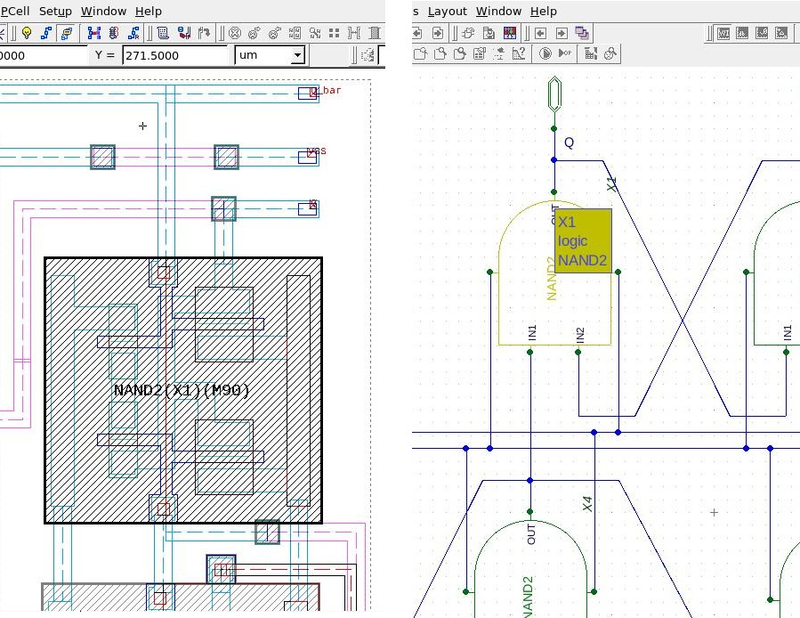 Expert provides the capability of creating layout from a schematic netlist in Gateway. The netlist driven layout (NDL) flow is described in the following example using a D-Flip Flop circuit. Add "Silvaco_demo_pcells" PCell library as a reference library by selecting Libraries->Setup , and clicking the "Add" icon and browsing to the file "Silvaco_demo_pcells.eld"
Select the menu item Tools->Netlist driven layout->Load netlist , and browse to the NDL netlist created in Gateway. This example uses the netlist dff_ndl.net. The PCell map file demo_pcells.map that links the netlist device names to the PCells will be loaded automatically because of it specified as Map file for NDL in technology data settings ( Setup->Technology->General ). After the netlist is loaded, the Netlist Editor window will appear as shown in Figure 1 . The left side of the window displays the netlist and the right side displays the Netlist Rover, which displays the circuit hierarchy and lists the netlist devices mapped to the corresponding PCells. To create the layout, right click on the "DFF" topcell name in the Netlist Rover section of the Netlist Editor window and select "create". All levels of hierarchy will be created containing the proper instances, and the top level cell will be opened in Expert and will appear as shown in Figure 2 . The routing of the circuit can be done with the aid of the wire flight lines that you can see in cell. More info on the flight line guide can be found in the Wire flight lines guide Expert example in the Editing category. 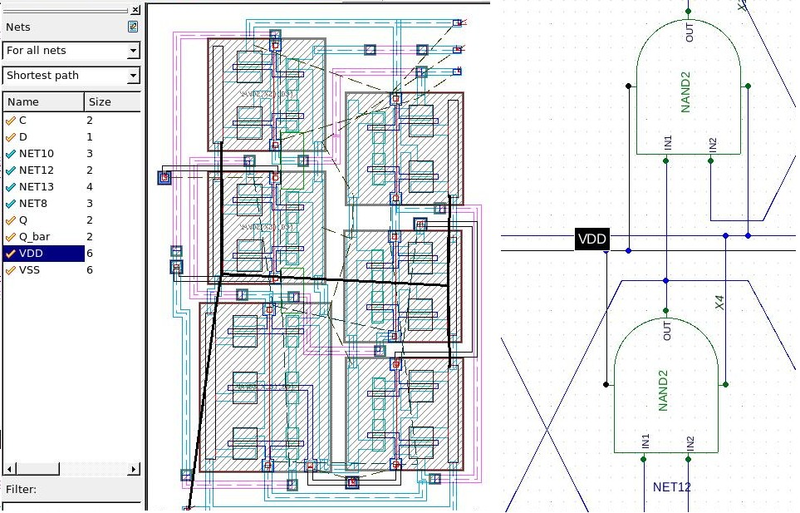 The Gateway schematic of the DFF and the Expert layout created through NDL can be linked so that cross probing of instances and nets can occur between the schematic and layout. Select the Expert menu item Verification->Launch Gateway , and a Gateway session will be opened in order to view the DFF schematic. Open the "expert_ex12.workspace" and open the DFF schematic located in ./symbols/logic/. Then select the Expert menu item Verification->Annotate . Now a layout instance in Expert can be selected and the corresponding schematic instance in Gateway will be highlighted. 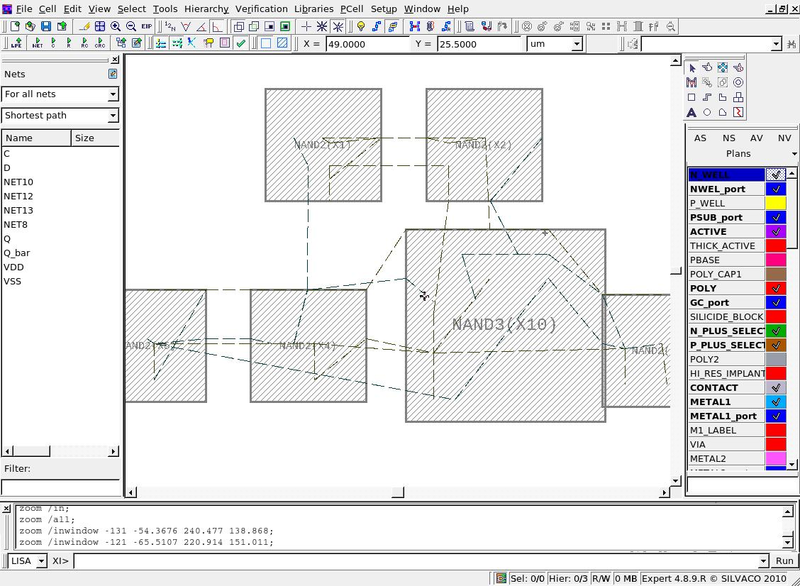 In Figure 3 the layout routing has been completed and the X1 NAND2 layout instance is selected in Expert on the left, and the same schematic instance highlighted in Gateway on the right. Circuit nodes can also be cross probed between layout and schematic. 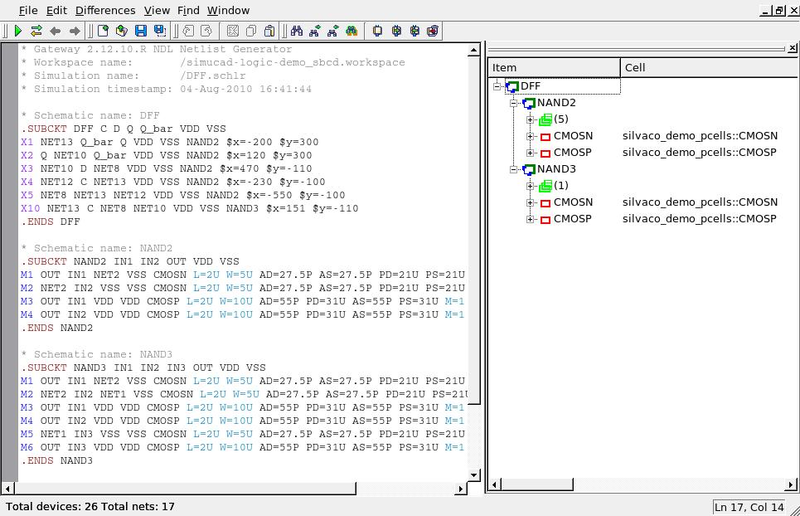 Figure 4 shows the VDD layout net selected and the VDD schematic net highlighted in Gateway.